This blog post will be a bit different than most of my posts because I am going to actually be talking about something that I sell. But I have specifically chosen to sell this product because I've used it extensively myself and found it excellent. I'm a satisfied customer turned reseller. Having said that, let me assure you that I'm not going to turn my blog into a commercial. If I ever do another post about something I sell, it will be a long time from now! I'm making an exception for this one because I invested so much in finding this product. For my readers who don't need web site shopping cart software (probably most of you! ), you can save yourself some time and stop reading here. There are a bewildering array of shopping cart programs available to Internet merchants like myself, ranging from free to extremely expensive. Last year a friend and I investigated a number of them in preparation for a major revamping of my primary business web site. We found that there are a lot of shopping carts that do some things well but very few that do everything well. 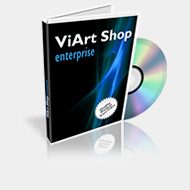 The reason we eventually picked ViArt is because it had all of the features I wanted at a reasonable price ($349 for the "top of the line" Enterprise version). Bulk upload and download of product catalog and categories in comma-separated (.csv) format that can be easily viewed and edited in a spreadsheet program like Microsoft Excel. Integration with PayPal, Google Checkout, Google Base, and Google Analytics. Ability to show category images (rather than just product images) on home page. For a full feature list, you can click here. Yesterday I had the opportunity to chat on Skype with a Muslim friend who was disturbed by my post last week encouraging Christians to pray for Muslims during the Muslim month of Ramadan. If my Christian readers need any more motivation to pray for Muslims, perhaps my chat transcript will provide some. It's long (7 pages) so I have posted it as a separate file. Click here to view or download. Please don't think of Muslims as being beyond the reach of God's grace. If you are a Christian, it's not because you were better in God's eyes than a Muslim. For many Muslims around the world, the month of Ramadan has just started. Ramadan is their special month of fasting from sunup to sundown, and is one of the five main pillars of Islam. During this month when Muslims are especially attentive to seeking the favor of Allah, we who are Christians can set aside special time to pray for the true God to reveal Himself to Muslims, bringing them to freedom from their sins through the blood of Jesus. There's a great FREE resource to help us pray for them. specific daily ways to pray for Muslims, or else sign up to get it delivered to your inbox daily. When my grandfather was young, his mother took out a life insurance policy on him. The year was 1928. He died last year. The policy had been taken out before the Great Depression. But fortunately she picked a good insurance company. Metropolitan Life weathered the storm and honored their policy, paying my mother and her siblings this year. I thought that MetLife should have used this incident as a "P.R." advertisement for their reliability as an insurance company. While it is certainly commendable that MetLife honored a 80-year old promise, why doesn't this cause us to praise God even more? God honors His promises for a lot longer than 80 years! And through circumstances a lot more difficult than the Great Depression! Think, for example, of God's promise to send Jesus the first time. Starting with the "seed of the woman" who would bruise the serpent's head roughly 4000 years B.C., to Malachi's prediction of the coming of the "messenger of the covenant" 400 years before He came, the Old Testament is packed with details pointing forward to Jesus' coming. He came the first time as redeemer, to rescue us from our sins. The Bible contains lots of promises for His second coming too. On that day, He will come as judge. Depending on our pre-existing relationship with Him, it will be either the best day of our lives or the worst day of our lives. Whether we look forward to it with anticipation or dread, God keeps His promises. Even better than MetLife. Isn't Catechism Supposed to Be Dull? This is a precious short video of Brad Melton's children being catechized. Check out Brad's recent article, "Education is Discipleship" and his wife's post about the practical use of catechisms in discipleship. This is old news (2008) but I just found it. I gave a presentation about the suffering church in a comfortable church in Chino Valley last Saturday night. I spent the night with a congenial 70 year old man whose son pastors the church. On Sunday morning, I rose, ate, and left for my own home church in Cottonwood. I was scheduled to give the adult Sunday School lesson that morning, and I was really looking forward to it. There are several ways to get to Chino. When I came, I came through Dewey, because that way is shorter from where I live. But to get to Cottonwood it's faster to go over Mingus Mountain and down through Jerome. I left Chino about 7:15 AM, which left me plenty of time to get to church. I took my time, enjoying the drive. When I turned on to Highway 89A, there were a few signs warning that smoke could cause visibility problems. Visibility seemed fine so I kept going. I was not disappointed by the beauty of Mingus. I stopped partway up the mountain to take pictures. I triumphantly crested the mountain and began the downward journey toward Jerome. No smoke on the road so far. However, there were small plumes of smoke rising quietly from small fires burning on this side of the mountain too. A mile or two down the hill side, I encountered a line up of about 6 or 7 stopped cars. Since there were not many cars in the line, and since there were no signs announcing a road closure, I assumed that one lane of the road had been closed (perhaps to allow parking space for forest service vehicles) and that the traffic was forced to take turns driving through the one lane portion. I turned the engine off, rolled down the windows, and stepped out of the car to enjoy the fresh mountain air. I snapped a few pictures of the fires burning nearby. A bus carrying a fire fighting crew was right in front of me. I wish I had used the delay to step inside and give them a 5 minute church service! Gradually vehicles started pulling in behind me and stopping. As the minutes ticked by some of them became uneasy and started asking other drivers if there was any word on how long the delay would be. No one knew, so eventually some people walked down to the flagman and asked for information. They walked back to us with grim news: they have no idea how long the delay will be. It was now 8:30 AM. I was supposed to be at church in an hour to teach. If the road opened it would take only half an hour to get there. If I went back through Dewey... could I even make it in time? It was an agonizing choice. Other drivers started turning around and driving away. I asked a driver behind me, "If I go to Cottonwood the other way, how long do you think it would take to get there?" He said, "I think about an hour." I took that as a sign that I should go. If it took an hour, I would be there exactly on time. But reversing direction was not fun. Somehow I didn't notice the mountain air and pine trees so much as I drove back towards Dewey. What if the roadway reopened five minutes after I left? I confess, I was too not happy with God! There are times in our life when we have to reverse course. To let our own labor go to waste. I encountered one of these a couple months ago when a business venture I'd attempted did not succeed. Giving up on it was not easy: it always seemed that success could be right around the corner. There is a bit of a gambling addict in each of us I think. Waiting for an easy solution that is possible but not certain seems much more attractive than taking a hard solution which always works. This reminds me of following Jesus. A lot of people want to get to God by their own good works. They might realize that their lives to date have not been stellar (actually God calls our good deeds 'filthy rags') but they think that they are on the verge of turning over a new leaf, of finally figuring out how to improve their behavior. To turn around and take the long and narrow but sure road of trusting Jesus is a tough choice. It means abandoning any conceptions of their own goodness and turning from their sins. Well, I did take the long route on Sunday morning. I still have not driven all the way across Mingus. I was 15 minutes late to church (and did get to teach!). But as it turned out, if I had waited for the road to open, I wouldn't have arrived until Wednesday! Don't gamble with your life. Reverse direction. Take the tough but sure route. Follow Jesus. Last Wednesday (a week ago) I had the unique opportunity to meet, in person, a Chinese friend I met on Skype several years ago. Since I met him, he's married and come to the US to pursue his Master's degree in public health. Nathan and Grace made a trip to see the western US (Las Vegas, Grand Canyon, and San Diego). 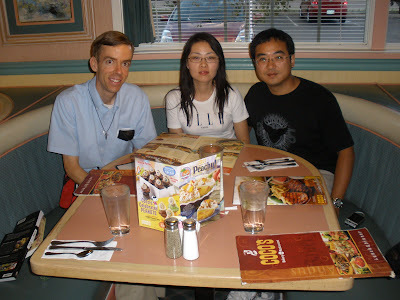 They came out of their way to meet me in Flagstaff, where we had dinner at Coco's together. Nathan and Grace are both survivors of the Chengdu earthquake. Grace was teaching English to a class of middle schoolers when the earthquake hit. They were actually practicing the phrase "What is wrong?" when the shaking started! Last Saturday evening I gave a VOM presentation at a church in Chino Valley. When I finished, my host for the night said, "I'm hungry, let's go to Coco's!" So I had my second dinner at Coco's in 4 days. Kind of funny since I hadn't eaten at a Cocos in at least 20 years! A shocking look at the provisions of the healthcare plan that is before the US Congress. If you are an American, this bill could dramatically affect your life. From a source as trusted as Liberty Counsel, this is something for Americans to ponder seriously. Here's the link. Early this morning somewhere around 3 I was awakened by a queasy feeling in my stomach. A trip to the bathroom quickly had me in full-fledged "stomach bug" mode. Something was trying to come out one way or another--soon! I was surprised. Isn't Mom supposed to be the one with stomach problems? Thinking of that made me pray for her. She is feeling this way a lot lately -- and yet most of the time the stuff can't get out. I had a five minute version of what is lasting, in varying degrees, hours and days and weeks for her. Well, I was getting close to passing out. I get very lightheaded just before "it" comes out, for some reason and although I have never actually passed out on past occasions, it sure feels close sometimes. So I decided to ask Dad to assist. He was sleeping at the opposite end of the house. I wobbily crawled down there, keeping my head low to maintain blood flow and trying to be quiet so I didn't wake up Mom in the recliner. She has been having a very tough time getting any sleep the last few nights, due to pain of backed up "stuff". Dad was at my service immediately and graciously. It made me think of a question my friend Arne posed on his forum a while back, "How many people in your life could you call at 3 A.M. if you had a problem?" This question really separates the friends from the acquaintances. I'm thankful I had someone. The sudden flush didn't last long. Still don't know what I ate that triggered it. I took four activated charcoal capsules (a very inexpensive and safe way to treat any kind of intestinal upset of this sort) and was asleep in a few minutes. Sometimes God just has to wake us up at three AM to remind us of how many things we have to be thankful for.